Ironically, it’s when I used the Jarlsberg, what I consider a pretty boring cheese in the world of cheeses (AKA Jessica’s Utopia), that we decided that this was the perfect recipe. The Jarlsberg, a cheese I never buy (it was given to me at a press event) is so mellow that it is not noticeably cheesy. It just ensures a very soft and moist center. That same night that I first made it this way, I was short on heavy cream so I just used what I had. The texture turned out even better, we thought. 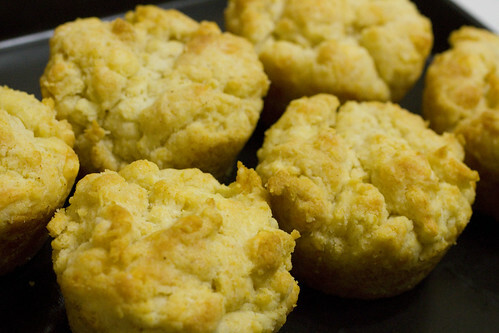 The resulting biscuit is what we consider the most perfect neutral biscuit that can be served with anything. The tops are crumbly with toasty edges. The insides are buttery clouds. These savory cakes feel as sinful as dessert. 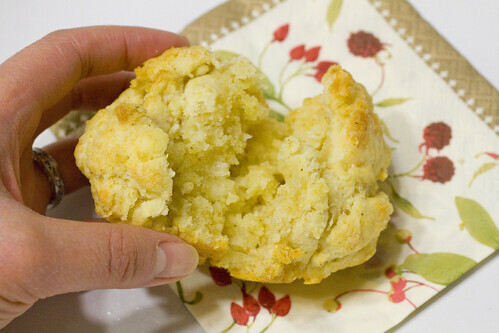 For something this perfect, it’s amazing that it is so easily made in a stand mixer. Quick, with no prior experience in technique needed. 1. Preheat oven to 375 degrees F. Spray muffin pan with non-stick spray. 2. In a stand mixer with paddle attachment, combine flour, baking powder, salt, and cayenne. Mix for 30 seconds on medium speed. Add butter and shortening and mix for 10 seconds on low speed. Add cheese and mix another 10 seconds on low speed. Add cream and mix until it just comes together. Scrape down the sides and the paddle attachment. 3. Spoon into muffin tin, dividing between 9 muffins, and bake for about 17 minutes. Muffins should be golden on top. 4. Let muffins cool in the tin for 5 minutes. 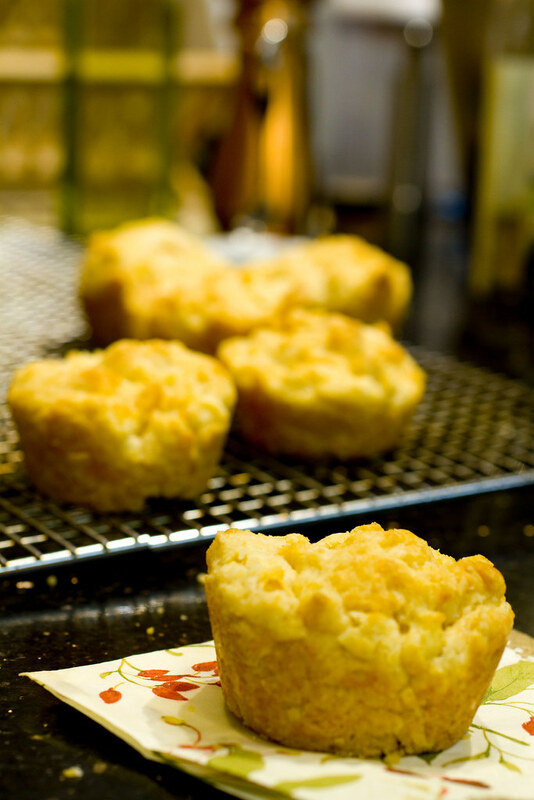 Carefully loosen the edges with a butter knife and gently remove from muffin tin. Serve warm or room temperature. posted by jessica	at 07:27 PM	Filed under American, Recipes. You can follow any responses to this entry through the RSS 2.0 feed. Both comments and pings are currently closed. These are absolutely beautiful biscuits. I love how you change up the cheese! Ummmm, cheesy biscuits. I love. Leesie, I hope you do try it and send me pictures! Grace, for me Jarlsberg has never been exciting until now. The “buttery clouds” sold me. Those biscuits look wonderful! And Jarlsberg, being a pretty mild-tasting cheese, would go well with just about anything. These biscuits look absolutely delicious!! Yum! James, you should be able to. Traditional biscuit method does not use a mixer, but because the higher liquid content here, you’ll want to use a bowl and just mix with a wooden spoon. Let me know how it turns out!! The muffin tin sure does cut down on the shaping and cutting time, and very much like a drop biscuit.